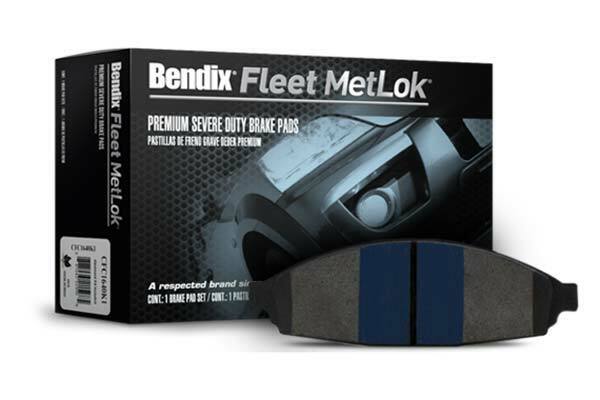 Bendix Fleet MetLok Brake Pads | Severe Duty | FREE SHIPPING | Lowest Price Guaranteed! From taxis and tow trucks to street-clearing salt spreaders, hard-working rides are subjected to extreme braking conditions on a daily basis. 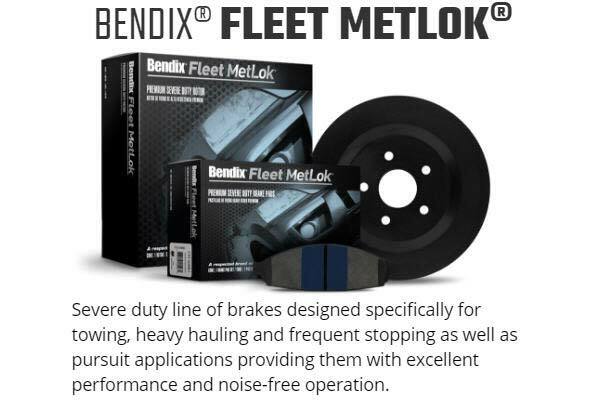 When your vehicle needs superior stopping performance, turn to Bendix Fleet MetLok Brake Pads. 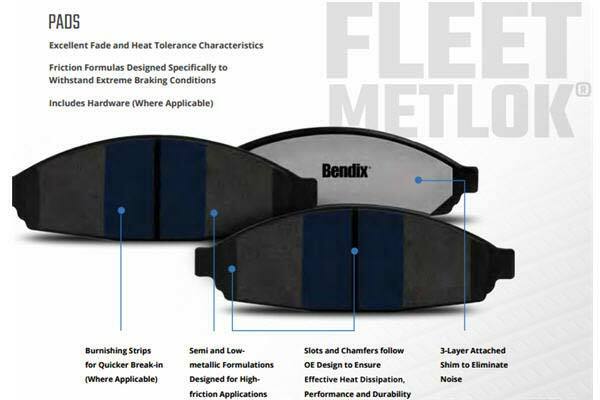 Engineered, formulated and manufactured specifically with your fleet vehicles in mind, Bendix MetLok Brake Pads feature a severe-duty friction material that had been tested and proven over millions of miles and under extreme and high-temperature situations. 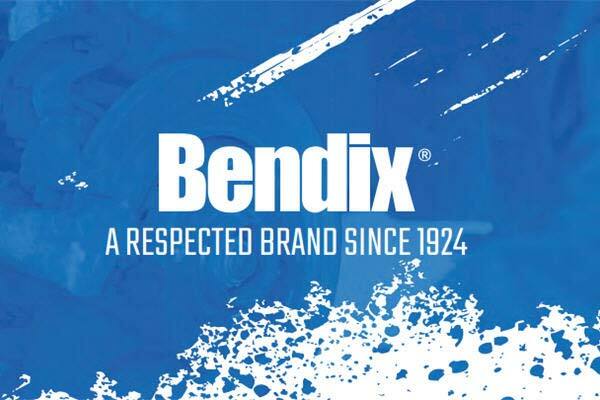 Not only do Bendix Fleet Brake Pads provide shorter stopping distances than other aftermarket and OE pads, they offer a premium attachment method that increases resistance to lining-plate separation and reduces downtime. 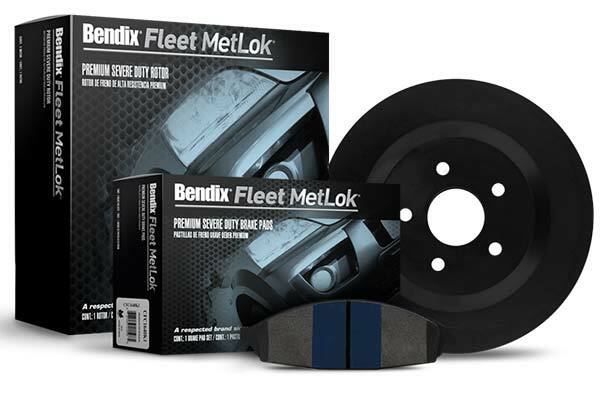 Easy to install with slots and chamfers designed to mirror OE, Bendix MetLok Fleet Pads are also equipped with high-quality steel shims to deliver noise-free operation. Your Bendix Fleet MetLok Brake Pads carry a 12-month warranty. I've put these on my f-150 since I tow close to the max capacity and we live in the mountains. I've read that semi-metallic is the way to go for this type of driving and they don't put as much heat into the rotors and ceramics. I've had no complaints with these on the truck, so when it came time to replace pads on our corolla we went with the same! We had ceramic pads on the corolla, but the rotors warped over the course of a year from heavy braking in the mountains. Am an old guy, ex dealership mechanic, done plenty of brake jobs... 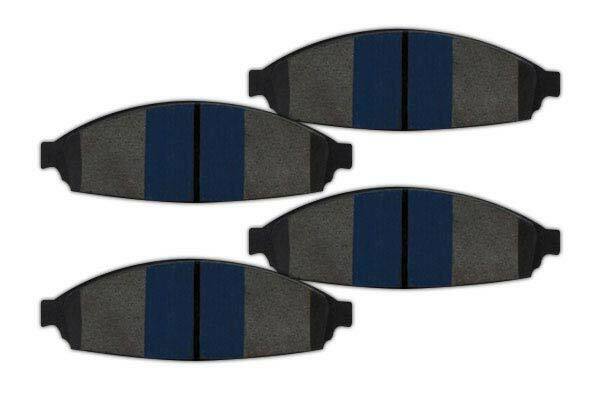 These pads on MY application are the best I have ever used, period. Complete package w/ ALL hardware. NO break in required, about 2-3 regular stops and that is it. I will only use this type/brand on all my vehicles from now on. I am starting to buy nearly all my parts for my Ford F250 from auto anything. The prices and shipping can bot be beat. Also so many other offers to choose from. Reference # 753-688-719 © 2000-2019 AutoAnything, Inc.